Is my form SSL secure if I embed it in my website? I created a credit card authorization form to be used with your secured server. If I embed this form on my non-SSL secure website, will credit card information be transmitted securely? I checked your form and see that you are asking for CC details in form fields. So that means that when the data is transmitted over internet it will be non-secured. 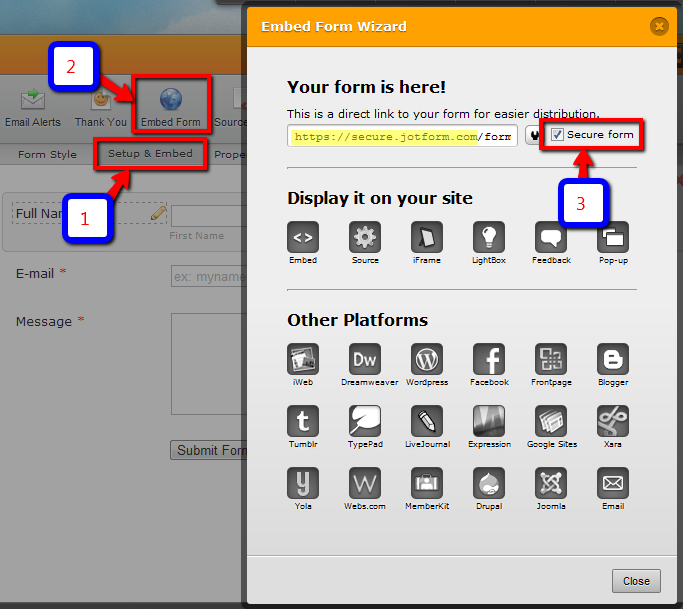 You should embed your form with secure method. Please explain how I would embed my form on my non secure website with a secure method. 2. Open your form in edit mode. From there, I selected 'Embed' button under 'Display It On Your Site'. I copied the code containing the secure information, and pasted that onto the page of my website. So now, when people enter credit card information on my website, it is transmitted securely to your secure server. Right? Please confirm. Yes thats correct. All information related to your form will be securely transmitted over internet.